With this release, we have streamlined the Edit Cache Listing page and removed inconsistencies that existed between this page and the Cache Submission Process. We want to make it easier to create cache pages with fewer issues so that caches can get published more smoothly. Here are some of the more noticeable changes. Waypoints are integrated into the Edit Cache Listing page. No need to visit another page to add/edit waypoints! Waypoints are “smart”, meaning cache owners won’t see waypoints that aren’t allowed for their cache type, and must enter waypoints that are required for their cache type. Attributes are integrated into the Edit Cache Listing page. No need to visit another page to add/edit attributes! Wheelchair attribute is enforced for T1 caches. If a cache owner selects T1 for their cache, the wheelchair attribute is automatically selected. See posted coordinates and waypoints on the same map! We’ve switched to OpenStreetMap, allowing you to zoom in and out, and double-check that you’ve placed the coordinates at the correct location. Posted coordinates are shown as virtual (blue) or physical (green). Waypoints are shown as virtual (blue) or physical (green), and denoted in the map pin by the prefix code. Parking, Reference, and Trailhead icons are brown. Cache owners can see if their posted coordinates or waypoints conflict with another physical, visible waypoint. The new map shows the red proximity circles, similar to what you see during the Cache Submission Process. If coordinates are too close to an existing physical, visible waypoint, a warning provides the distance, GC code, and link to the conflicting cache, along with a reminder about proximity guidelines. Proximity warnings are not provided for virtual or hidden waypoints (such as finals for Mystery Caches). The Submit for Review process is simplified. Cache owners are required to enter a Reviewer Note when submitting a cache for review. If a cache owner wants to edit a cache that is already submitted for review, they need to cancel their cache submission. The cache owner can then resubmit the cache for review, and enter a reviewer note explaining any changes they’ve made. 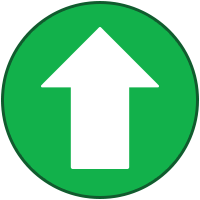 When there is a new Reviewer Note from a reviewer, it will appear at the top of the cache page, prompting the cache owner to either to respond or to edit the cache page. D1 is enforced for all Event Caches. Event Caches must have a 1-star difficulty rating because it is easy for geocachers to “find” events. Event Caches no longer include a container size. The Admin Tools no longer link to separate pages to edit attributes, edit waypoints, and upload images, since you can make those changes on the Edit Cache Listing page. In addition, the links “Watch” and “Add to List” are available only after publication, because we found that they were not used by COs prior to publication . The Edit Cache Listing page now includes an Upload Images link, so cache owners can add photos via that link. Previously, there were two text fields to describe your cache. During the Cache Submission Process, those were the cache summary and long description. On the Edit Cache Listing page, they were the short description and long description. Going forward, there’s just one field. However, the short description field still exists for any caches that currently have a short description. If a cache owner removes an existing short description from their cache, the field will disappear. The Related Web Page field now only exists on caches that currently use that field. If a cache owner removes an existing Related Web Page, then the field will disappear. Nadja (LivingInNarnia) from HQ’s Product team is watching this thread to answer questions whenever possible. Same thing here. But maybe I misunderstood what is the intent with this field's deletion. Plus, some owners use them to link to their Wherigo cartridge. Almost all Wherigo owner in my homezone use the "related webpage" field to link to the cartridge. Also, there are quite a few puzzles which use the feature, although this might not be a big problem if existing fields are allowed to stay forever. And we'll have work to redo tutorials to explain how to create your first cache! But at least we see that it moves and the geocaching still has many beautiful things to discover! Even behind our screens! Does anyone know the solution to my problem? The Admin Tools no longer link to separate pages to edit attributes, edit waypoints, and upload images, since you can make those changes on the Edit Cache Listing page. Nice! It always felt clunky going to other pages to do these things. Note that the reverse is not true. I can select a higher terrain rating, then select the wheelchair attribute, and the higher terrain rating remains. And there's an interesting edge case: When you first edit a T1 cache, you can raise the terrain rating, and it will let the wheelchair attribute remain. But if you then select T1, it will tell you that it is enabling the wheelchair attribute, and from that point on, raising the terrain rating will remove the wheelchair attribute. Have you tested this with colorblind users to see if the shades of blue and green that you use can be distinguished by them? vs "less than 100 milliliters"
vs "100 milliliters to 1 liter"
vs "1 to 20 liters"
vs "more than 20 liters"
Do the differences reflect a deliberate change in the definition of the size ratings? If so, are existing caches "grandfathered", or are owners expected to update their size ratings according to the new definition? The thing we've never been able to change is cache type. * Waypoints are integrated into the Edit Cache Listing page. * Attributes are integrated into the Edit Cache Listing page. These changes add unnecessary clutter to the page. Sorry to say but I feel they were better on their own page. * Map is more useful. * Cache owners can see if their posted coordinates or waypoints conflict with another physical, visible waypoint. Granted. But once it's set, it's in the way. Maybe one of those arrow things to hide it when not needed. The same might be done for the other parts of the edit page. * The Submit for Review process is simplified. Really? It was a single click from the top of the page before. How can it get easier than that? In the log area wasn't sufficient? I don't understand why you need to reinvent the wheel. Aw, you got to be kidding! That was one of the best features of the old set up. six of one, half dozen of the other. Actually, the separate fields were useful when doing a series. The short description allowed for a header repeated throughout the series while the longer field afforded individual content for each cache. The separation made it easier to manage. But oh well, I guess there wasn't high demand and we won't be seeing that again. Um, I understand this discourages linking to commercial sites but some puzzles relied on the related web page. This is the second time you've killed puzzling - the first being a total butcher of the image upload process. Thank you! The Related Web Page option was removed from the Cache Submission Process a few years ago. And now, it is removed from future listings (only old listings that already had that field filled out will show up). The cartridge link and information related to puzzles should be provided in the description. (It should also be noted that the related web page is already not displayed in the mobile app). 2) Do you mind if we attempt to change the cache type for you on our side to reproduce the issue? My guess is that cache owners were not seeing the reviewer notes that were displayed in the log area. This change puts the reviewer note front and center, where they're more likely to see it and respond accordingly. Thanks niraD. I guess I assumed when a submitted cache is disabled (by a reviewer), it should in theory get a CO's attention. Not to mention the CO gets an email too. So to me the idea is just plain weird. GeoMuBa notes s/he can't change the cache type. I hope that gets fixed because I do that all the time. Something I forgot to mention. The reason I noticed these changes was because I've been struggling with the idea of using the onsite checker. I have over fifty puzzles that don't require a checker but finally broke down and decided I'd add one anyway. Insecure people like confirmation. But unfortunately, I can't. It won't save. In the log area wasn't sufficient? No. You would wonder how many COs were just submitting cache for review over and over, without ever scrolling down to log area to read reviewer note. This change is very positive. I'm in the process of a publish, and my first impression of the new page is otherwise pretty good. Rikitan. Yes, I guess I would wonder. I quite like the log system for discussion with the reviewer. So, I guess I hope that remains despite the added note at the top of the page. Thanks for the input. I see where you're coming from, but the trouble with enabling the mousewheel for the map on such a long page is that it creates an awkward experience for people scrolling. You begin to scroll down the page with the wheel and then come to a jarring halt once your curser is over the map. Thanks for the feedback! Looks like there's a small caching issue with the solution checker (if you refresh the page you should see the solution checker display on the cache details page). We'll get it working so that it shows without needing to refresh. FWIW, I recently added a solution checker to my own puzzle cache. I considered Groundspeak's built-in checker, but ended up deciding to use Certitude instead. Maybe when the built-in checker is more mature, I'll use it instead. But I haven't had any problems saving my changes with the new system. I moved the content from the short description to the long description (and the short description then disappeared, as advertised). I tinkered with the terrain ratings and the wheelchair attribute quite a bit (see my first post to this thread). But I was able to save all my changes just fine. We were able to reproduce the issue and are working on a formal solution. Thank you for your report and patience. You should then receive a prompt to confirm that change. 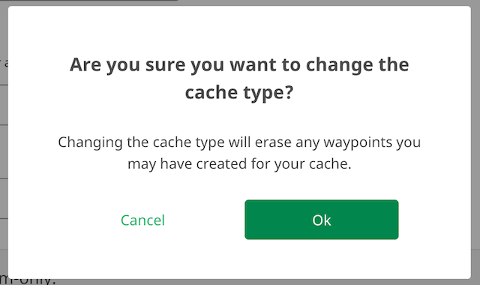 Be aware that changing geocache type now erases additional waypoints; this is because waypoint rules vary by cache type and the rules are now being enforced. Let me know if this workaround works for you. Again, we'll be following up with a formal solution shortly. Removing link to CO's cache's edit page in the original quote. Yes, log flow stays there, unchanged. Banner on top of the unpublished page is just addition visual help for new cache owners to help them list their cache quicklier, without communication troubles. Agreed. There's a pretty big difference there. Has anyone ever seen a 1 litre apple?! I mean, sure, there's this one, but the "Small" size goes a lot larger than the typical apple. There needs to be a good definition of the sizes that's then used consistently across the website and app. LivingInNarnia, thanks for checking into it. Just so you know, I did refresh but it still didn't show for me. I'll try again in a few days and see how your progress goes. Thanks. By the way, when I mentioned arrows above... I mean similar to how the html code is toggled visible/hidden. That's easy to do, so hopefully you can include something similar for the map and other clutter on the page. That said, I really wish we'd keep a text list of attributes. I'm not an icon kind of guy. Thanks again. niraD, yes, I've been using certitude too. Far superior. But for the stuff I had in mind, the caches are really a no brainer. More like 'unknown' rather than puzzle types. So I intended to push the checker way down on the page so it wouldn't distract from my layout. But it wouldn't stick. Be aware that changing geocache type now erases additional waypoints; this is because waypoint rules vary by cache type and the rules are now being enforced. That's scary. I'm sure it isn't uncommon for a cache to be submitted as a Multi or Mystery and the local reviewer to suggest that it should be listed as the other type. It would be unfortunate to have a listing all set up, only to change the type on the advice of the reviewer and lose all the waypoints. Yep, I know. It's a tradeoff Best would be a button to toggle the wheel zoom. I think the problem is that in this case the map covers the entire width of the page (which is a design once again geared towards mobile display; all the content is laid out with a vertical format) which is a VERY large map just for seeing where waypoints are. Functionally, I like the single page workflow, but for desktop there are layout options that would make it more user-friendly, imo. I really like that the placement map is now always there. Just a thought, and I'm not sure how much of a coding nightmare it'd be, but it'd be nice if it could show red circles for the hidden physical waypoints of other caches I own. Regarding wheelchair attributes: the attribute is only required for T1. A cache could potentially be wheelchair accessible at a higher terrain rating and that is up to the CO and reviewer to discuss if needed. See the guidelines here for more info: https://www.geocaching.com/help/index.php?pg=kb.chapter&id=97&pgid=82 Thanks for pointing out that edge case. Regarding sizes, both the milliliter/liter and the more descriptive sizing are used in the Help Center article you referenced. We are using the the descriptive sizing to provide people with a visual, a little easier to understand. The size descriptions are meant to be a guide, we will look into adding more visual language to help with that. I really wish we'd keep a text list of attributes. I'm not an icon kind of guy. If just icons are going to be used without the accompanying labels, then there at least needs to be a tooltip on each one so they're more identifiable. Right now you get nothing if you hover over them. Yes, you can click on the link to visit another page to look up what each attribute is, but that information needs to be available on the icons with either a label or tooltip. Tooltips should be there! Is there a specific attribute for which you are not seeing the tooltip? I'm not seeing tooltips on any of them. I'm using Firefox 57.0.1 on Windows 10. That article doesn't really discuss the wheelchair attribute much, whereas this more specific one seems to confirm the historical understanding that T1=Wheelchair accessible and Wheelchair accessible=T1. Argh. IE11 bites again. I'm not seeing tooltips for any attributes in IE11, but they work fine in Chrome. Agreed that this is a bad design. I should be able to change my unpublished cache type without having it wipe out waypoints. Change your design to execute a validation routine upon save that highlights waypoints that are invalid for the chosen type. I normally visit the "releases" section to complain... but this time all the changes seem positive. It would be nice if the descriptive sizing didn't conflict with the more precise volume-based sizing. To add to my post above, I'm also not seeing tooltips in Firefox 56.0.2 (I haven't updated it to the latest version on this computer yet). Darn, we'll look into getting that fixed (and for Firefox too!) Thank you! Yes, that should be changed to a more common "... about the size of a PET preform or smaller." The problem is that a single object to represent a range means there will be much more variation in how each size rating is interpreted. For example, what if my cache is the size of two apples? It's bigger than an apple (which is a Small), so is it now a Regular? Maybe there needs to be a representative object for both the low and high ends of each range. Regardless, the descriptions need to be revised in order to strike a balance between precision and conciseness. Right now, the descriptions are so concise that they don't adequately define the size ranges. I expect that a preform is even more unknown to the general public than a film canister. I'd never heard of them until they started to be used as cache containers. Many cachers don't even realize what their real purpose is. Tooltips across browser depends on whether it's the ALT or TITLE attribute and on which tag. Should be an easy fix. Agreed, most common containers worldwide would be best if used as a metric, else a photo with an approximate size reference, since measurements are different worldwide too. Can you make it so that you can use scroll to zoom after first clicking (anywhere) on the map? That will prevent the problem of getting trapped while scrolling past the map. Except I've never seen a PET preform in this country (Australia) and have no idea how big one is. Whatever description is used, it has to be something easily recognised globally. I prefer the definitions in litres as they're unambiguous, but then I live in a metric country and have a good intuitive feel of how big a litre is. Beware of making the interface work differently on your particular page from how it works everywhere else, and therefore from how the user expects it to work.